Among freedom, reality, forms and messages, Villanes’ work is an attack on reality to the crudeness of our society; it’s a wakeup call to the events that go unnoticed. The discourse on freedom is so powerful in contemporary societies that no one dares to question it. This is even more when it comes to art. However, it has become imperative to scrutinize the issue and, all at once, dismantle the ambiguous and fickle tale of creative freedom. Could art really be autonomous, separated from politics, ethnic conditioning, of the social arena? Is it feasible to keep working with the linear idea of an aesthetic historiography doomed to absolute independence? It is clear that the answers are rather complex. They would require huge tests and a thorough analysis of creative processes throughout human history. They would require the revision of the narrative on which we build our system of thought. It would be enough for me to say, nonetheless, there are artists who are still orbiting around that other reality that occurs outside of art. The here and now. Artists for whom gates lack meaning since everything, in the end, are part of the all-embracing process of human existence. One of those artists is the Peruvian, Eduardo Villanes (Lima, 1967). 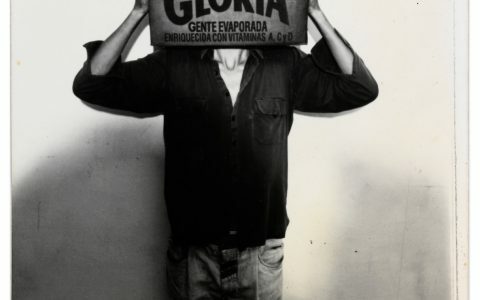 When first approaching Villanes’ work, luck, or some kind of mischievous Moira, brought me to his interview with Lima Gris concerning an act of censorship carried out by the Telefónica Foundation against one of his exhibition projects. I found Villanes’ words in the magazine so sincere and consistent, that I haven’t been able to glance at his work without taking a look at the man behind the artist. That nobility of the committed artist, which many consider out of fashion, would end up being daunting. 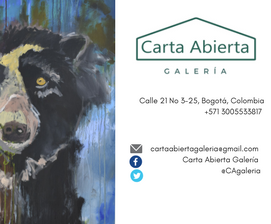 The stagnation within the cultural circle, roused by other aesthetic trends that look at exhibition rooms as a modern day Parnassus, never ceases to inspire pity, even more so if we stand in front of figures of this Peruvian artist. That is how I found out that Villanes created activist related artwork during the ‘90s –today this is called artivism, and essentially, stands out from “political art” by using spaces in the city as the natural grounds of artistic practice and also due to its energetic involvement in the sociopolitical tactics of civil responsibility. The main series made during those terrible years of the Fujimorista dictatorship were Gloria Evaporada and Kerosene. Both pieces referred to the multiple disappearances due to political motives that happened in the country. Work from this period was marked by persecution and secrecy, shortages, censorship and pain. Likewise, it was riddled with the willingness to complain, courage and conviction. This would be the beginning of Eduardo’s path, a path that he has steadily and consistently followed. Villanes’ most recent work upholds the theme of his work from when he started. His entire body of work has been constructed as a continuous line for more than 20 years. 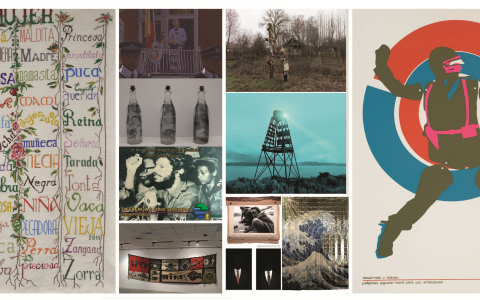 It is noteworthy that, as an artist interested in social problems and enormously cathartic politics, his work branches out in several directions as far as genres go. 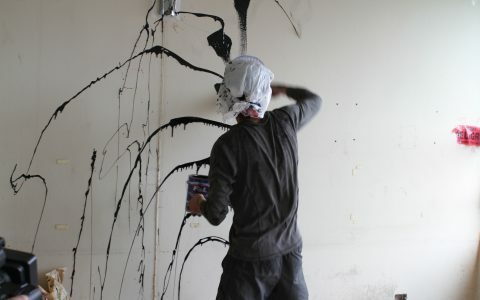 In effect, he works with interventionism, performance, action art, as well as painting, photography and video. Existing within that expression there is a reaffirmation of his commitment to the arts as a platform to inform and disagree. He uses art as an effective mechanism for change. 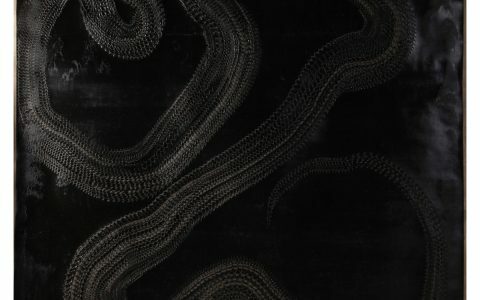 Among his most recent pieces, we find Razor Wire, a series that explores the universe of mankind’s obsession with limits and exclusion. That proposal began as one of the artist’s personal experiences when he returned to Peru in 2011 and tried to reunite himself with the Pacific Ocean from Costa Verde: “To my surprise, I discovered that in the Barranco district, there was a section cut off by razor wire. My first impression was that it looked like a parapet surrounded by typical climbing plants like lilac which had died. An exclusive building ‘with an ocean view’ was built there. It was part of the ‘construction boom’ and the resulting loss of public spaces, currently taking place in Lima,” says the artist. The profound change in the landscape, which was once open and clear but is now rural, restrictive and exclusive, led him to see the razor wire as a physical emblem for contemporary barriers. It suffices to say that that kind of barbed wire was exclusively designed to prevent people from going from one space to another and, it is placed on border areas and prisons. Based on this aggressive element, which is a metaphor for the expanding barriers between people of our time, Eduardo decided to convert the wire to corn, an indigenous crop in the Americas. Thus, through sculpture, that which is the cause of death and amputation was turned into food and life. Once more, the weight of the piece would be located in the gesture. The final piece will only be a part of the process, what is the essential. However, it will be the discursive charge of the action.